You may have noticed that a new record has been established in the art world. Whatever kind of record could that be? An award for the fastest painting ever? Or the biggest? Obviously, it could not be for “the best” -- no two people would ever agree on that. Of course not. We’re talking money: David Hockney’s painting “Pool with Two Figures” has been sold -- at auction -- for nearly $90 million. A record for a work by a living artist. When the hammer came down on the winning bid, those gathered in the auction room applauded. What were they applauding? Hockney? His painting? I think not. Basically, it was the money. Writing about the sale in The New Yorker, Andrea K. Scott observed: “But too often these days, when we talk about art, we talk about money." No doubt they do. But we do, too. We -- us soccer people. These days, when we talk about soccer, we talk too often about money. Just in case we forget to pay homage to Mammon, there, to keep us in line financially, is Forbes Magazine. And so to soccer. Forbes has just informed us that Atlanta United is now the “most valuable” team in MLS, and that it is worth $330 million. A money judgment, then. As though that is all that matters. What has Forbes to say about the team -- say, the way it plays, what makes it exciting to watch, even a word or two about the key players? Nothing. 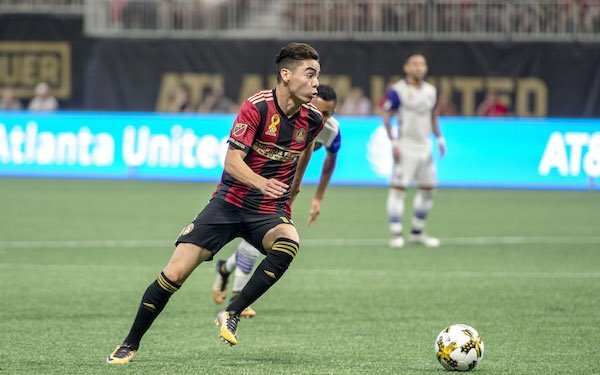 Miguel Almiron and Josef Martinez do get a mention in a nearly 3,000-word Forbes article, but only to laud the fact that their shirts sell well. So we’re presented with a long Forbes article that says a lot about money but virtually nothing about soccer. Well, Forbes is a financial magazine, so what’s wrong with that? Quite a lot, it seems to me. Primarily because it implies that financial success has nothing to do with soccer success. Indeed, reading through the Forbes story there are patches when the sport seems to have vanished altogether. Maybe it’s the marketing of lawn mowers that is being discussed. This inability to come to grips with -- I’ll use the term much used by financial and marketing people -- the product (soccer) is bound to lead to misunderstandings, misjudgements even. For a start it is quite extraordinary that among the nearly 3,000 words of the Forbes article, there are two absolutely key words in any discussion of MLS finances that never appear: single entity. Miguel Almiron. Photo: Courtesy of Atlanta United. This omission may well please Don Garber and the other MLS honchos. The single entity structure, a sine qua non in the birth of MLS, has become something of an embarrassment. If not that, then certainly an awkward obstacle that stands in the way of the inevitable onward and upward ambitions of the league. That problem -- of the league’s financial policy thwarting its own growth -- does not get discussed by Forbes. Yet it is mentioned -- and treated rather as a plus than a minus. Which is quite true. But the problem of MLS clubs bringing in promising youngsters is that -- assuming they dazzle -- they will quickly be carried off by richer European clubs. I find it difficult to believe that a genuine soccer club, with a large number of devoted (please, not passionate) fans can be built up if the club regularly -- say, every two years? -- sheds its most popular players. Forbes has a different viewpoint. Very different. Unloading young stars is to be welcomed as a good thing. How so? Because they are an asset “who the team can eventually sell for a profit.” We are asked to view the team merely as an entity that has a chance to make a profit. Is that how professional sports teams become popular ... and successful? The soccer club as a business. This is a view that I cannot accept, believing as I do that a club should be something more welcoming, something warmer. Something that calls forth responses more human than a mere desire to make a profit. MLS, at this moment, is something of a fantasy league. All of its leaders know perfectly well that, as long as it continues with its single entity structure, it cannot achieve its stated aim (certainly not an impossible one) of becoming one of the world’s most important soccer leagues. In a word, it does not pay its players well enough. A league that can only attract top players when they are past their best, a league that, when it does sign younger stars, will rapidly lose them to high-spending European clubs. The Forbes view -- the soccer-as-business view -- would seem to reflect the current realities of professional sport, the hard, no-nonsense reality of Darwinian economics. It is a fact that when we talk of soccer, too often we talk of money. Yet there is evidence that Forbes is (as I would expect) blithely unaware of the full implications of its delight in selling-on young players for profit. The give-away is the use of the word “eventually.” These bright young stars can be sold on eventually says Forbes -- obviously unaware that eventually is more than likely to mean “quickly” -- after two, or even one season. It’s not just players. Atlanta has already lost coach Gerardo “Tata” Martino, the key man in acquiring the young players. And it seems that Almiron, and maybe Martinez, will also depart soon. After just two years. Can that really be the way to build on the phenomenal success that Atlanta has achieved? Is that fair to the fans? But that is the way that MLS is condemned to operate. Forbes is beside itself with glee at the thought of the profit to be made from selling young players, and quickly points out that the league can also sell promising American youngsters developed by MLS clubs themselves. How about Alphonso Davies, sold by Vancouver to Bayern Munich for some $20 million? This is an astonishing amount to pay for a virtually untested 17-year-old. I doubt it will be repeated any time soon. But Forbes evidently sees it as a sign of dollars to come. And therefore unassailably a good thing. MLS commissioner Garber may also see it as proof that the large amounts of money that the league’s clubs invest in player development -- now over $100 million a year we’re told -- are paying off. Maybe. But there is abundant evidence from within the USA itself that player development programs, to be successful, need much more than a copious flow of dollars. They also need soccer awareness and intelligence. In the USA, youth soccer is probably better financed than anywhere else in the world, yet it has so far proved quite unable to produce the stream of top class players necessary to make up a strong American national team. As for the MLS, its teams feature virtually no top players who have come through its academy system. The best of those players move quickly, and not necessarily profitably, to Europe. Where they are unlikely to find life easy. Those who remain in the USA are the merely good, not the exceptional, players. For many of the American youngsters the glamour of playing in Europe seems to be as big a lure as the dream of a huge salary. Either way, the reality works against MLS. Whether its young stars come from abroad or from the USA, MLS will not hang on to them for very long. We are left with a thoroughly unsatisfactory image of MLS. Its detractors still see it as an elephants’ graveyard for over-the-hill stars. While Forbes, more up to date, happily sees it as a profitable factory supplying young stars for the rich teams of Europe. Garber has no need now to refute the accusations that MLS is a retirement home for has-beens. The league has proved that is not so. But it would be useful to know what Garber thinks about his league’s current status: Adding teams, proving that its business plan -- single entity -- is working well, but nevertheless a league that is becalmed, treading water because those same single-entity regulations prevent it from spending the money that would allow it to challenge for a position among the world’s elite leagues. And I do not think that it is good enough to point to some distant future when single entity will automatically vanish as the money pours in. If that is the vision, then it is difficult to understand why MLS is spending $100 million a year on player development that produces very little. But I must admit some doubts about my own position. I have made it clear that I find Forbes an irritating magazine (not least because of its use of the word "monetize"). I do not believe that creative activities can be measured, nor appreciated, solely in terms of financial gain -- that everything can be monetized. Whether it is that Hockney painting or the Atlanta United team, the element of human creativity looms large, and that is not something to be measured in dollars. Forbes, as I see it, is a perfect example of Oscar Wilde’s definition of a cynic: Someone who knows the price of everything but the value of nothing. I want to see the value of a soccer club measured in the activities of the people involved -- the directors, the coaches, the players and the fans. That seems right and proper to me. But ... if I’m wrong? If the world has so changed during my lifetime that my view is simply out of date? That the idea of a soccer club (or, I suppose, any professional sports club) is now generally accepted to be that seen through the dollar-tinted Forbes spectacles: that the sporting values take second place to the money-making activities. Is it possible that today’s fans, today’s MLS fans, will find that acceptable? I hate the sound of that. I wouldn’t want that to happen. But I fear it. 13 comments about "MLS: A league shackled by its own regulations". Wooden Ships, November 23, 2018 at 6:39 p.m. Romance in sport isn’t a priority these days. Fans are largely to blame, they aren’t lemmings or are they? Spending influences decisions. Very disappointed with our non-international schedule, no training compensation and no pro-rel. these aren’t real soccer people running the show in the states, they’re Johnny Come Latelys. Good article sir. John Soares, November 23, 2018 at 7:15 p.m.
Forbes is a "money", "Financial" magazine. Of course it is going to report on the financial aspects of this enterprise, sorry, team. The article would read the same if the enterprises, sorry teams, in question were MU or Real. Yes USA soccer/MLS has issues, but money rules in Europe as well..... and no, not all European owners are "soccer" fans. That includes several Americans. Bob Ashpole, November 23, 2018 at 11:42 p.m.
Good, thoughtful article. The MLS business model is flawed, but so is the typical European model. If a house is a "money pit" for the owners, then a professional soccer club aspiring to win trophies is a "money black hole" for its owners. Without some kind of limits, professional soccer becomes a battle of the biggest wallet rather than a sport. I don't understand how fans can get excited about a battle to avoid relegation. Instead of trying to win, those teams are trying not to lose. Trying not to lose didn't interest me as a player or a coach. I certainly don't find it entertaining. It is strictly about results, not about the sport. Might as well watch someone flip coins. That is how boring that type of soccer gets. At least to me. When fans of European soccer talk about European soccer, they are talking about the few powerhouse clubs with the big wallets. The quality of play in the "top leagues" falls off quickly and greatly after the teams at the top of the standings. Wooden Ships replied, November 24, 2018 at 7:12 a.m. Going to have to disagree with you Bob on the single entity and the lack of risk reward. Metaphorically, it’s like nonprofit leagues. Interesting you don’t find survival dramatic. Safety net for everyone is not our economic model, but it sure has become our cultures mantra. Bob Ashpole replied, November 25, 2018 at 12:16 a.m. It is not that survival isn't dramatic. It is that the quality of the play is bad enough that I have no interest in watching matches of the bottom tier teams. David Gee, November 24, 2018 at 11:05 a.m.
We cannot ignore reality. Throughout the futball world, the bigs cannibalize the smalls for good players. In the Premier League, the Man Citys are buyer clubs and the Southhamptons are sellers. Across borders, the La Ligas are buyers and the Eredivisdies are sellers. The Brazils supply the Europeans. Within leagues, the first divisions feed on the lower divisions. MLS is a seller league. So is Mexico when it comes to the top leagues in Europe. And until MLS starts winning some CONCACAF Championship titles, it will be behind the Mexican in terms of the world pecking order. It may be unfair, but unfortunately this is the reality of global futball and its foundation of money and results. This is how things have evolved. Lamentable. The situation might respond to tweaking, but hoping for reversal is quite unlikely. John Soares, November 24, 2018 at 1:41 p.m. The rewards of moving up to the primier leagues in Europe is "money". when the big boys come to town, "money". It does not improve the quality of play, especially at the top. Elevated teams seldom make it anywhere near the top. England now has 5 "big" teams but only due to hundreds of millions "money" from outside of the country. "Money" is and will continue to be the main motivator. The winners go on to European and invitational tournaments earnining more "money". The little guy stays home home, and possibly lose there better players. Hello second divission. * The main reason most fans put up with this!? They are raised cheering for "two" teams. The local and and one of the big "three". Real, Barca, Juventos, Benfica.... have more fans outside of their city than within. That phenomena will never happen in the USA. If we get to the point where 3 or 4 big teams dominate, the whole thing falls apart. In the USA we all want, on the first day of the season to feel "this could be the year". Not as in Europe, knowing for certain that 20 of the 24 teams are eliminated on day one. Before a single game is played. Tom G, November 24, 2018 at 3:53 p.m. Sorry this is a less than satisfying article and no constructive ideas or Solutions offered. soccer is an entertainment Business. In business if you don’t make money you cannot invest in the future or improve or survive in long run. A comparison to art is a stretch at best and arguably a poor comparison - hard to take seriously. Critique of Forbes is way off the mark. I expect better commentary from thispublication. Bob Ashpole replied, November 25, 2018 at 12:24 a.m.
Generally speaking club owners expect to operate in the red. If they are operating in the black, they are selling off assets. The typical payoff might be a tax shelter for other income or making a profit selling the ownership interest. Owners are not rich because they own a soccer club. Dean Mitchell, November 25, 2018 at 4:09 p.m.
MLS is still a long ways away from competing with the European giants and I don't see any way to buy tradition or see Pro-rel work like it does in England. Yet. For example Pro-rel in Mexico has cost the league some genuinely good organizations (Leones Negros, Dorados, Chiapas..) and added pathetic ones like Lobos BUAP....and they have American style playoffs on top of that. What if DC United or the Galaxy were relegated last year and SF Deltas or Louisville took their place? Is that what we want? This "selling team model" applies to my Liga MX team Xolos de Tijuana as well. Every player worth a damn gets sold. We have no core to build from year-after-year...but the stadium is full (no paper sellouts like Orlando or San Jose—it's actually full) and the fanbase is supportive. I'm curious to see how Atlanta deals with this issue. They are truly remarkable and I certainly hope they maintain their juggernaut rise. But those 53,000 fans will need to understand it's more like a college football program with rotating stars on their way to the top...and hopefully their kids will see MLS as one of the top world leagues in the next generation...and be able to afford it. R2 Dad replied, November 25, 2018 at 6:20 p.m. Yes, Dean that IS what we want. Imagine the wretched SJ earthquakes get relegated because they're crap--duh--and the Deltas get promoted. The Earthquakes fans are despondent and vilify their owners for being douchenozzles. In embarrassment, Earthquake ownership actually has to pay attention to the soccer on the field (vs doing whatever else it was they've been doing the last couple of years), invest in players, promote academy kids, get a clue. But they get an enormous parachute payment to help them make the transition to USL. Earthquake attendance is cut in half, but that leaves only the "real" fans, who get scarves and pins to document their fealty, like the Croix de Candlestick pins the Giants used to hand out for surviving a night game at the "Stick. The Deltas, who play at Kezar, find this a double-edged sword because their stadium would need an upgrade as would some players. More investment flows into the club. In an Open Cup match months later at Kezar, Grandpa Wondolowski is slow and late to the ball and harpoons Jackson in the chest a la De Jong/Alonso. Blood spills, the crowd is hysterical, cops on horseback accidentally trample an Earthquake trainer in the mayhem. It's the media story across the planet for 12 hours. The Deltas raise their profile further by then sending flowers, chocolates and the entire SF Mens Chorus to sing festive songs to the trampled trainer, who begins a torrid affair with on unnamed Chorus member. The gate increases, media expsoure and income increases, local retail benefits. Our coach Marc Dos Santos signs on for a long-term contract instead of going to Vancouver. The Deltas are underdogs and the soccer isn't that great, but they're playing against MLS teams and now they have to increase N Judah trains to handle the crowds. 18 people in SF protest the foot traffic in Golden Gate Park is interrupting burrowing owl mating rituals, but everyone else is having fun. The underdog Deltas stay up the first year by a non-miraculous blown ref call VAR can't fix. Then the Galaxy get promoted, and now there are home-and-away matches against the hated rival that relegated them two seasons previously. This is how great rivalrys/derbys are made. Instead, we get "Republic FC pays $150M for a seat at the MLS table. Don Garber is ecstatic, and buys a Carribean island". Robert Reeves, November 25, 2018 at 4:37 p.m.
First there ae the European national leagues, most of which hae become dominated by the few "big spending" clubs. Promotion/relegation may create some interest and excitement down the table, but the winners are almost predictable on opening day. So, to keep up the interest, we invent "Chapions Leagues" in various flavors; how long before bigger spending clubs come to dominate these as well? So now Chamions Leagues with tiers. What next? Single Entity may be hard to swallow for some, but we have a competitive league; that pays for lots of sins. Or do you want the richest club to be the winner every year? Salaries must continue to rise and young and exciting players must be retained, but there are several babies not to be thrown out in this bathwater. Ahmet Guvener, November 26, 2018 at 12:59 p.m.